I‘ve been looking at some of my ‘standard’ embroidery reference books, and I can’t find a single one on my shelves that actually shows you how to thread a needle easily! They all assume that you already know. I also assumed that it was common knowledge. But these days, apparently, it’s not: needlework and embroidery are not always taught in schools, often parents and grandparents don’t stitch, or even darn and sew on buttons, so a lot of people never learn. They struggle or they rely on wire threaders. I keep on finding that I have to show people this method. So there’s obviously a need for a quick lesson. I was lucky enough to learn from my maternal grandmother, who had been a milliner in her youth. Her eyesight was poor, but her sewing thread always went into the needle’s eye, usually at the first attempt. (When she was almost blind she was given some of the calyx-eyed easy-threading needles and she hated them. She found it much easier to thread normal needles using her usual method by that time: yelling at my mother or me to come and thread it for her!) Grandma taught me as soon as I was old enough to use a needle, while she could still just see enough to thread one, so I’ve always done it this way. It’s one of those ‘dead easy when you know, but tricky to explain’ things, so bear with me. And apologies for the less than perfect photos. I really needed a second pair of hands for the camera, and didn’t have them. I had to make do with a tripod and the timer. 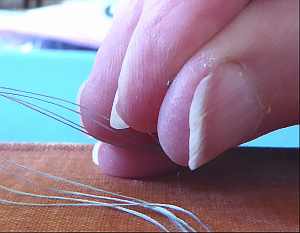 Here I’m threading four strands of fine filament silk into a size 24 tapestry needle. 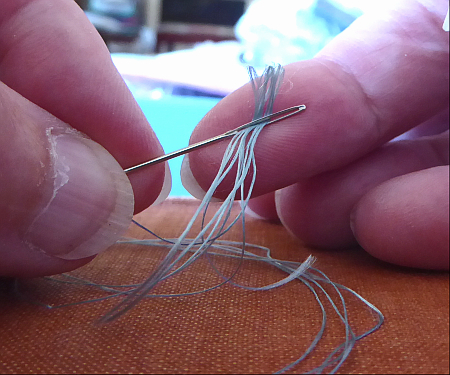 To start , you fold the last few of centimetres (an inch or so) of thread over the needle. 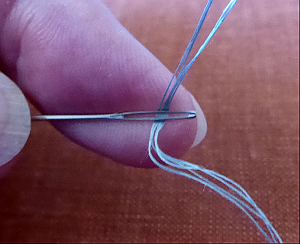 Pinch the folded thread where it passes over the needle, pinching it between your first finger and thumb. Use your left hand if you’re right-handed. I am a lefty so my needle is in my left hand and the thread is held in my right in these photos. 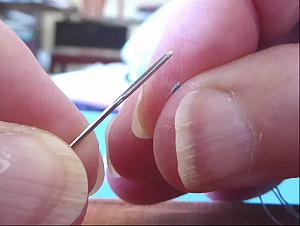 Then pull out the needle, leaving just the fold of thread pinched firmly. Now let the tip of the fold just show between your thumb and finger, only the very tip, and lower the needle’s eye down over it – you may need a little gentle sawing action as you work it down onto the the thread, between your finger and thumb. Once it’s in, and you can see you’ve got all of the strands into the eye, pull though the loop of thread through and the job is done. Sometimes you might miss the thread or only get part of it in the eye: in that case, just straighten it out and try again from the beginning. If you have a stiff thread that won’t bend easily, or a needle with a very small eye that won’t take a folded thread, then cut the thread end cleanly and pinch that, rather then folding it over. But still always lower the needle onto the end held between finger and thumb, rather than waving things about in mid air!. Once you have threaded needles this way a few times, you will find stitching and sewing are suddenly very much easier – and very more relaxing. Unthreading the needle to unpick mistakes or darn in ends will no longer seem a chore, because you won’t worry about re-threading it afterwards. You won’t even think about it, it will become second nature. If you find this method works for you, please pass it on and make stitching more fun for someone else! This entry was posted on July 13, 2018 at 2:02 pm and is filed under Embroidery, Needlework with tags how to, how to thread a needle, needle, threading. You can follow any responses to this entry through the RSS 2.0 feed. You can leave a response, or trackback from your own site. Yes, that’s my method. Like you, learnt from Grandmama! I find it less successful for the round-eyed Japanese needles, but as I tend to use them with stiff threads, the “hold them up in the air and poke” becomes viable as a substitute. I’m definitely turning into my Grandad – “What _do_ they teach kids at school these days?” Must watch that. I loved him dearly, but I’m an old-fashioned sort of girl and even I thought he was downright antedeluvian! Yes, that’s how I do it too. As I have mono-vision (one eye working at a time), I could never have the needle and the thread in the air and asume that they would meet miraculously :). And I can indeed thread the needle this way with closed eyes and still have success about half of the time. I usually end up threading many needles for my students. Even telling them that I don’t really see what I am doing, does not always entice them to keep trying themselves. Having a human needle-threader is just so much easier :)! Even with a round eye and a stiff thread, I would rather thread the stub held in my fingers than try to poke. I, too, can’t coordinate two hand that well (I also use one eye at a time). Thanks for your comments Rachel, Kathryn and Jessica. If we keep teaching people how to do it, with luck we’ll have someone able to thread our needles for us when we are past doing it ourselves! Thank you for this tip. I tried it last night and ended up stitching longer than normal because it was so easy to change threads. I had a bit of trouble at first and remembered your comment about using too small of a needle. Once I switched to a larger needle everything was much easier. Thanks! I am glad to learn I’ve been some help. Yes, unless there’s a special reason to use a small needle (such as beads or fragile fabric) going one size up often make life much easier. Good luck with your stitching, Kathleen.